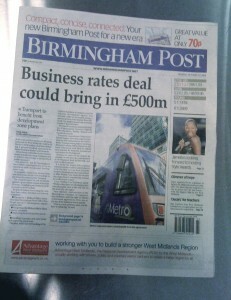 So today I read a paper version of the Birmingham Post for the second time in a week. Last Wednesday I picked up a copy before going on a plane and it was almost impossible to read, I couldn’t fold it into a readable shape without punching the bloke next to me (it was Ryanair and there’s about an inch between your nose and the seat in front). And it looks nice, clean and spacious despite the drop in size. I’ve not tried reading it on a plane, but I did get the other half to drive me round and around the Robin Hood Island while I sat in her corsa — seat pulled right forward — and it was easy enough. I’m not taken with the lighter blue for the masthead (than has previously been used on the website) — it works better online, but is a little dull on paper. Any darker and it might have looked like the Metro. White out of a block of colour does feel a little cheap, no doubt I’ll get used to it, but it feels odd. The content of the paper is more mixed-up inside, which I liked. I always felt it was a con to put the sport on the back of the Business section — which otherwise I could cheerfully have recycled and had less to carry — the back of the paper seems more natural. Quality local sport coverage is something to push, there’s not so much competition out there. I really liked the pull out quotes from the blogs and comment that were dotted around the paper — comment is becoming more important than news these days for a paper, when was the last time you bought a paper and found out something brand new? The website looks cleaner too, although there are still a few glitches deeper into it to be ironed out, and like I said the colour works well on screen. Go read the (rather excellent) blogs. Will it encourage more readers? Maybe, let’s hope. Enough people bought it today to see what it was like — maybe a relaunch every week could provide the sales boost they’re after. Disclaimer: I write the odd (very) blog post for the paper, which doesn’t mean I’d be nice to them if I didn’t mean it (hell, they didn’t even invite me to the relaunch party ;) ). I don’t read the post that often i usually read the birmingham mail. But i think the mail really needs to step up its game. The blogs and comment are better on the Bham post website than the mail site but i think youre right by saying that newspapers need more comment. There is one blog on the birmingham mail website by a hospotial radio presenter Nathan Jolly and its really good but i have to print it out to take to my mother who hasnt got the internet! They should really consider having them in print format.